Pushing visual and material boundaries. We often 'hear' with our eyes as much as we do with our ears, and there has always been a demand for musical instruments that are aesthetically striking. When we think of musical instruments, we often think of them as being made of certain materials, selected through the centuries for their musical efficiency, durability and availability for production means. 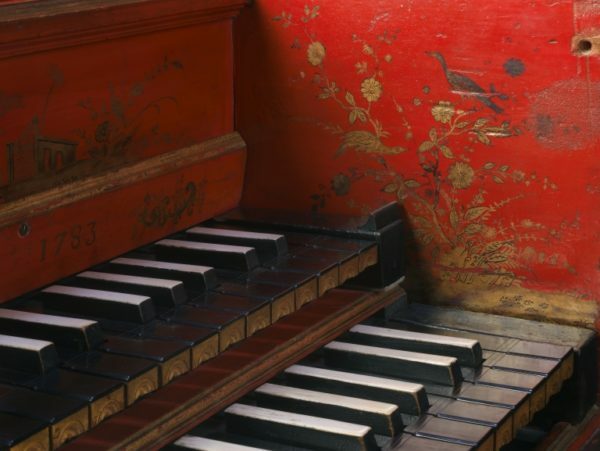 Similarly, the appearance of most musical instruments was standardised by the end of the 19th century - we almost automatically expect to see the black lacquer of a grand piano, or the typical shape and colour of a violin. 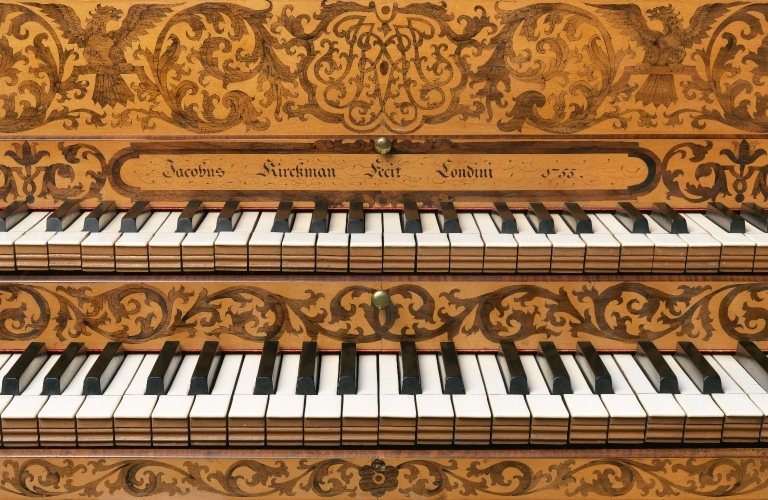 But through the centuries instrument makers have used an enormous variety of materials, from the rare, to the opulent, to the downright strange. And likewise, makers have sometimes eschewed convention in ornamentation, creating highly decorated musical instruments that can only be described as 'a bit over the top'. Here are some instruments that push visual and material boundaries. 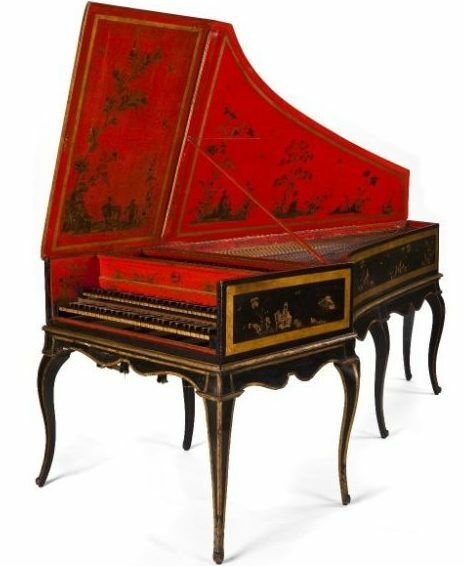 This double manual harpsichord by the famous English maker Jacob Kirckman is particularly notable for its high quality wood veneers and marquetry. Marquetry is a furniture decoration technique which uses small pieces of differently-coloured wood in a mosaic-like manner to create elaborate designs. 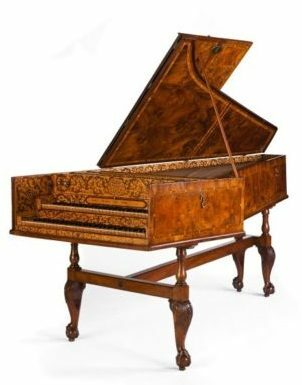 While English harpsichords of the 18th-century were known for their marquetry and fine veneering, especially the use of burr walnut (a highly decorative natural pattern that sometimes forms in the wood of some trees), this instrument is an extreme example of the style. Because marquetry was often created by clamping layers of contrasting woods together and then using a fine saw to cut the designs, it is almost certain that another instrument was made with the exact same marquetry pattern, but in a negative image. 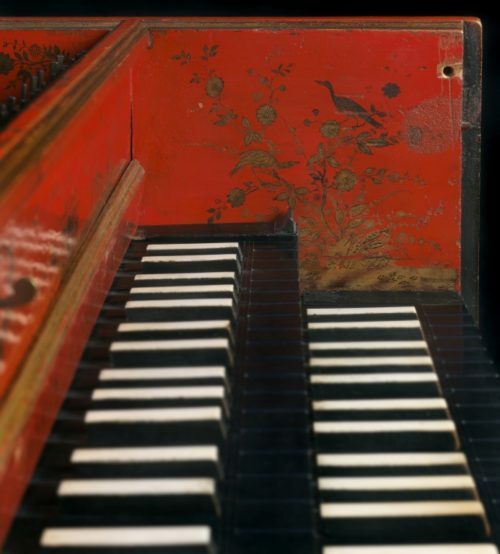 Intricately decorated harpsichord by Jacob Kirckman, held in the University of Edinburgh collections. While it is common for modern flutes to be rather plain looking, in the past they were sometimes made from rare and precious materials. In the late 18th and early 19th century, flutes made of ivory were popular with the wealthy. This instrument makes an ivory flute look common by comparison ? it is made from narwhal horn, an extremely rare material. Narwhals are a type of small whale found in the Arctic Ocean. They are noted for having an extremely long, corkscrew like tooth protruding from their mouth which makes them look like they have a single horn. It is thought that narwhal horns traded and collected during mediaeval times helped to propagate the legend of the unicorn. This flute is turned from a single piece of narwhal horn, and the spiral grain of the horn can be clearly seen. This is an extremely rare and unusual use of this material; only two other examples of wind instruments made from narwhal horn are known to exist, one of which was made for Frederick the Great, and is now in the Metropolitan Museum of Art in New York City. Narwhal horn flute, from the collections of Royal Pavilion and Museums Brighton. 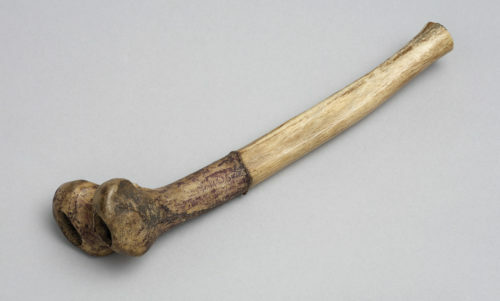 Here's a candidate for possibly the most macabre musical instrument of all time: a trumpet made from a human thighbone. But the Tibetan Buddhists who made this instrument had no morbid intentions; the use of human remains to make this instrument was not to show reverence to the deceased, but indifference to the human condition. Thighbone trumpet, from the Royal Northern College of Music collections. The head of a drum is its most important working part. Traditionally, drum heads are most often made of animal skins, most commonly goat or cow hide. Sometimes however, other animal parts have been used to create more complex instruments. This lyre uses a crocodile's head as a resonator. Crocodile lyre, from the Russell-Cotes Museum and Art Gallery. 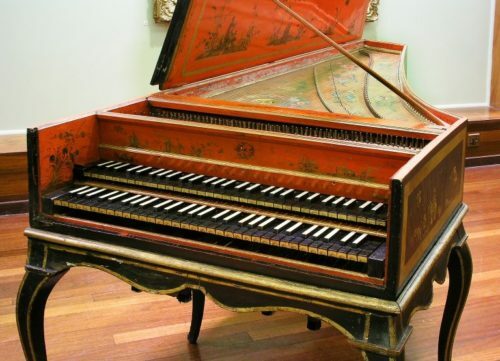 This harpsichord was made by the famous Parisian harpsichord making dynasty of Jean Goermans and Pascal Taskin. It is decorated in a technique known as 'chinoiserie', which is a European ornamentation technique which imitated Chinese and Japanese design motifs that were originally created in paint and lacquer. The European version was not always particularly faithful to the original, and often showed anachronistic elements such as European plants, animals and objects. Although employed as early as the mid-1600s, chinoiserie reached its greatest height of popularity in Europe in the mid to late 18th century, the time period when this instrument was built. This edge-blown globular vessel flute, made of a dried and hollow fruit shell, was made in Zimbabwe and is known locally as a chigufe. However its unremarkable appearance belies a potentially deadly secret; the seeds of this fruit from the mutamba tree are known for containing a lethal amount of the well-known poison strychnine. However, after the seeds have been removed, the flute is safe to play. We hope. 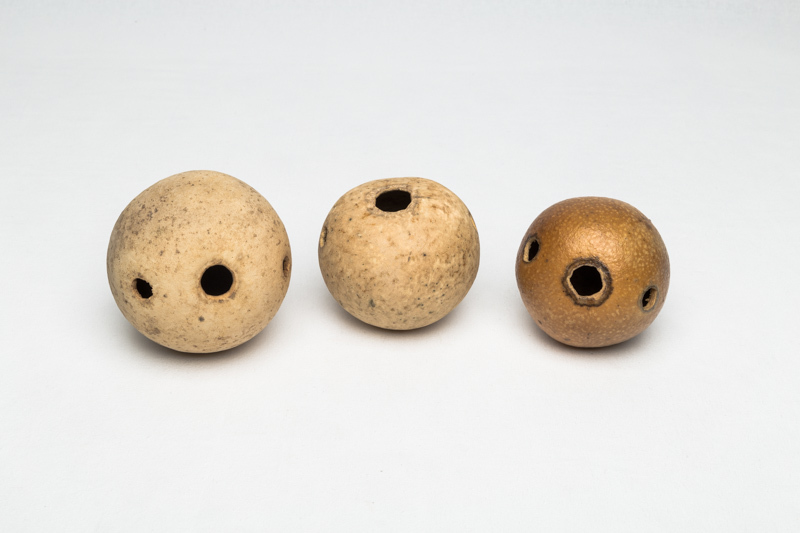 Three Strychnos fruits made into flutes, from the Economic Botany collection of the Royal Botanic Gardens, Kew. 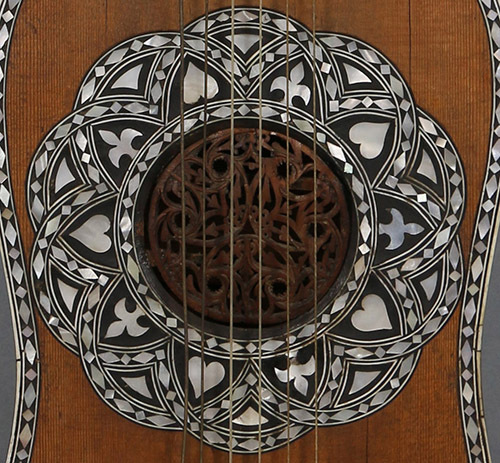 This baroque guitar is an amazing example of the kind of ornate decoration that can be applied to string instruments. 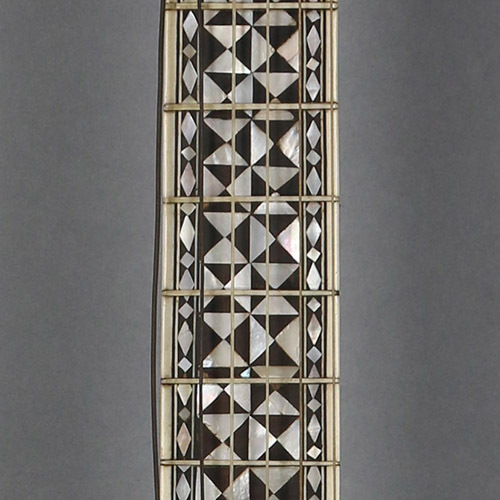 The back and sides of the instrument are of highly figured snakewood inlaid with bone stripes. The instrument is bound with bone and mother-of-pearl. The top and fingerboard of the guitar are highly inlaid with mother of pearl in geometric designs and a vase and flowers design. Elaborately inlaid instruments such as this were meant to be status symbols as much as they were to be used as musical instruments. Not only are most cellos and other violin family instruments made of wood, the vast majority are made out of very specific types of wood: flamed maple for the back, sides, and neck, and spruce for the soundboard. This cello is made entirely from sheets of iron alloy, bent and welded together. The instrument has been painted to make it resemble wood. The only actual wood used on the instrument is the sound post and the bridge. It was made by a blacksmith and was played at a number of concerts in the early 20th century. Early heavy-metal music? A cello made of iron, from Saffron Walden Museum.